Sputnik Ceiling Light: Vintage style with 8 lights and mid century modern pendant light with black color body and spiral bronze lamp cup .The special design can highlight the perfect lighting effect. It's the perfect light fixture to install in bedroom, living room, dining room, foyers ，bar ,restaurant ,hotel and any place you like. Safety and Reliability Guarantee：UL listed ，One Year Money Back Guarantee. We offer free standard shipping and replacement for broken products in one year. Dimmable: it can be dimmable when you used with a dimmable bulb and compatible dimmer switch.DIMENSIONS: Overall 23.23"Dia x 9.06"H. Ceiling Canopy 5.11"Dia x 0.98"H. Voltage: 110V-120V, fits every E26 light bulbs . Works with incandescent, LED, CFL, halogen (60W max, sold separately).If you want to buy light bulbs, please copy this number( B07K7P18YJ ) and search on Amazon. 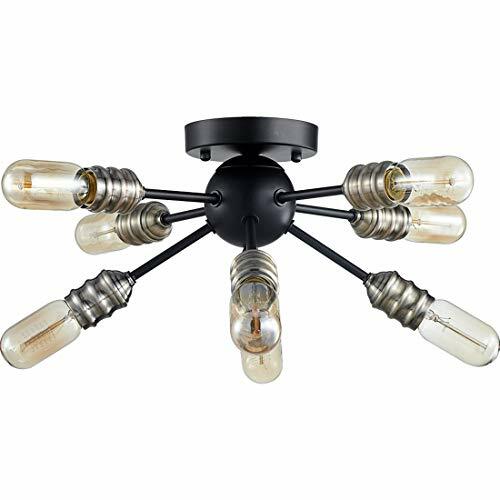 Sputnik Ceiling Light - Vintage style with 8 lights and mid century modern pendant light,with black color body and spiral bronze lamp cup.The special design can highlight the perfect lighting effect.It's the perfect light fixture to install in bedroom, living room, dining room, foyers ，bar ,restaurant ,hotel and any place you like. Safety and Reliability Guarantee： UL listed ，One Year Money Back Guarantee. We offer free standard shipping and replacement for broken products in one year.